In a phrase, Bill Browder was one of those furtive American oligarchs whose mission was to steal everything in sight from Russia after the Soviet Union was dissolved. He was a CIA operative whose shell companies were set up as a platform from which to misappropriate Russian wealth however he could. Remember, the C.I.A. is known as The Company in intelligence circles because that’s exactly what it is—a massive transnational intelligence corporation that sells it ultra-classified information and privileged data to the highest bidder–always. The very same Ashkenazi bankster bloodlines that oversaw and financed the 1917 Bolshevik Revolution in Russia set up shop in Chicago. This is why Chicago has always been controlled by the Democratic political machine. The greater metro Chicago area is a magnet for disaffected Eastern and Central European Jews, as well as Russian Jewry, who all shared a deep hatred of Russia. There is no precedent in U.S. history where a British citizen was capable of conning the U.S. Congress into considering (much less approving) such fraudulent and predatory legislation against a foreign nation. 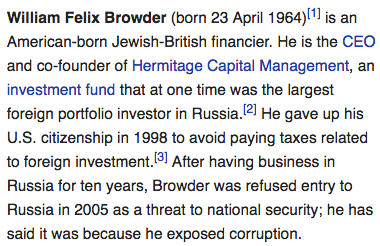 There’s a very good reason why the preceding Wiki bio states that Browder was refused entry into Russia in 2005. Just like the Russian oligarchs, such as former oil tycoon and convicted criminal Mikhail Khodorkovsky, who transparently pillaged, plundered and raped Russia during the Boris Yeltsin years, American oligarch Browder was sent in by the CIA to do the very same thing. Except that Browder got caught with his hand in the cookie jar just like Khodorkovsky. The thieving Russian oligarchs either fled the country to Tel Aviv, London or New York City or they made peace with President Putin by agreeing to put Russia first. Some like Khodorkovsky and Platon Lebedev were imprisoned because they thought their Western handlers and London bankers would protect them. After Khodorkovsky handed off his worthless Yukos stock to the Rothschilds, no one expected him to be incarcerated in a Siberian prison for 10 years. 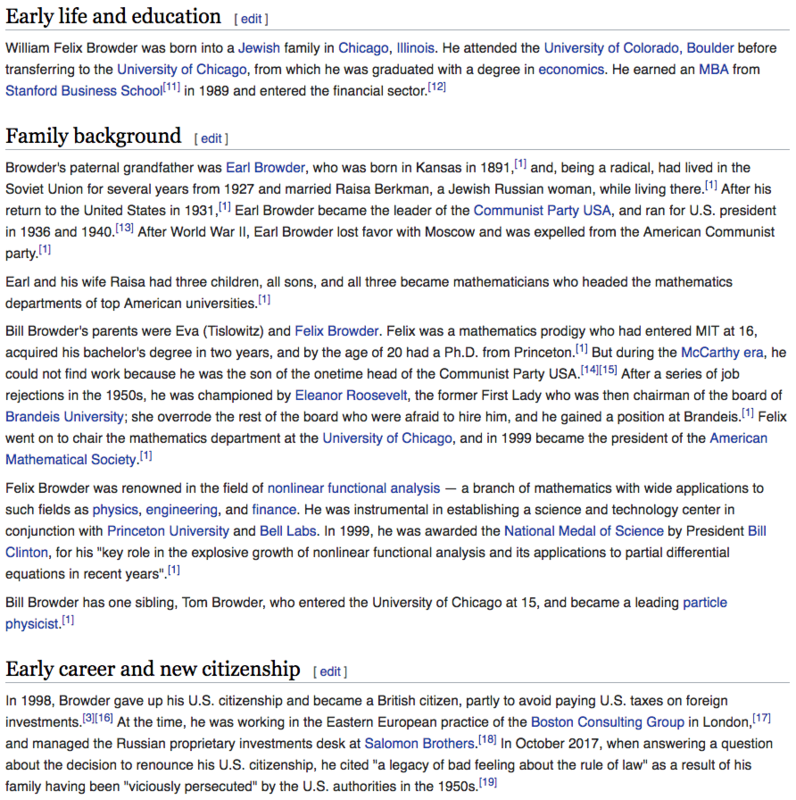 As for CIA asset Browder, he was given a glowing reception by the entire Neocon Zionist community in the United States, United Kingdom and Israel. Not only was he able to strongly influence powerful US Senators such as John McCain (Deep State’s shadow Secretary of State) to pass what is known as the Magnitsky Act, Browder also pushed Canada to pass a law modeled after the same legislation. How many people in the world possess the power to successfully promote patently unlawful legislation in various nations but a stone-cold CIA asset? KEY POINT: Because he was such a valuable witness against Bill Browder, the Russian government would never have permitted Magnitsky to die while in their custody. The scuttlebutt within intelligence circles is that the MOSSAD arranged for an insider to take him out in such a manner that framed the prison administration. Only in this way could the C.I.A. 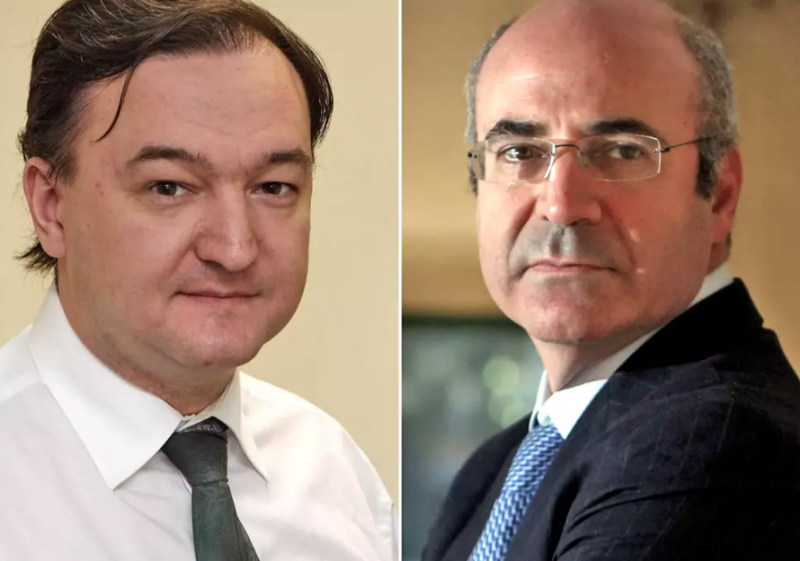 be assured that Magnitsky could not testify in court against Browder. This shocking and brazen hit also set him up as a martyr for the Magnitsky Act, which it did quite successfully. How does an obvious work of juvenile fiction shoot up to the top of the New York Times Best Sellers except by purposeful design? Very few are aware but the C.I.A. does not only control the entire mainstream media sometimes known as the Mockingbird Media, The Company also controls every other form of media to include book publishing. No book makes it to print unless the C.I.A. permits its publication in the USA. Similarly, so-called spy books like Red Notice only make it to the NYT best seller list with the artificial manipulation of the CIA overseers at Langley headquarters. 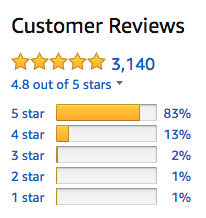 The dead giveaway that Browder’s fantastical fabrication was promoted in this spurious manner are the thousands of utterly fake “Customer Reviews” at Amazon.com. This current table of reviews clearly indicates that the vast majority of these extraordinarily positive reviews were made by bots. Of course, those extremely favorable and detailed reviews that were in fact written by the CIA’s Mockingbird Media department are so effusive and over-the-top that they give themselves away as naked media agents and Russophobes alike. The real tragedy of Bill Browder’s bogus narrative is that the C.I.A. killed a Russian lawyer, who was working with the oligarchs thieves; the C.I.A. then blamed the murder on the Kremlin. As usual for all of these CIA-manufactured Russophobic intrigues, a false flag assassination was used to smear Russia with awesome effect. This highly consequential false flag operation has obviously had an extremely chilling effect on American-Russian relations. It was only this July that President Vladimir Putin just let the cat out of the bag. 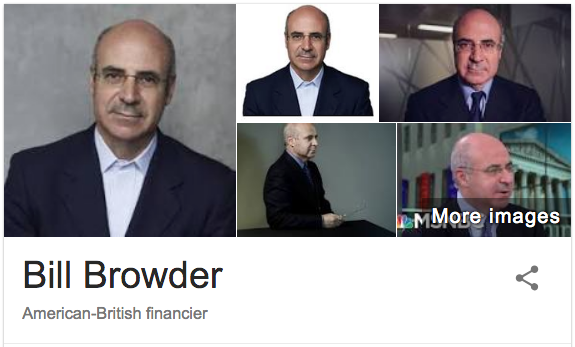 That Bill Browder was, in reality, Hillary Clinton’s bagman to the tune of $400 million plus. Yes, that is the dollar amount that Browder misappropriated from Russia which was then surreptitiously channeled by intel assets and contributed to Clinton’s 2016 presidential campaign. Can it get any bigger than this?! Browder quite purposefully positioned himself at the very nexus of the U.S. and U.K. Intelligence Communities so that he would enjoy the full protection and cover of those intelligence agencies and secret services while conducting his numerous black ops. investment firm Kuhn, Loeb and Co.) stationed in New York City and London who financed the Western-engineered Russian Revolution 100 years ago. 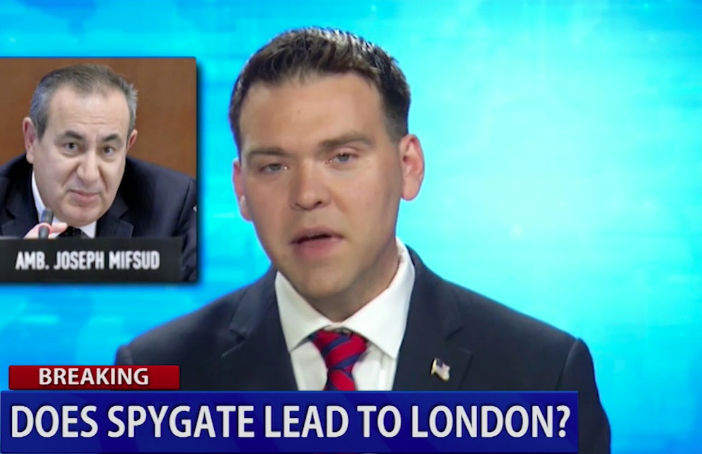 What this unparalleled crime spree indicates is that the British-run Spygate was also a big piece of Browder’s portfolio. We’re talking about a 21st century James Bond here whose secret headquarters was strategically located in London—the heart of Russophobia. After all, it was the overlords of the British Empire who initiated the Great Game against Russia centuries ago. Those rapacious overlords will simply not be satisfied until they have pilfered every square inch of the Russian Motherland and its natural resources. First, it’s of vital importance to understand that Veselnitskaya is a true Russian patriot. Her real mission was to meet with Candidate Trump to inform him of the scandal involved with the passing of the Magnitsky Act. The American Intel Community was well aware of Veselnitskaya’s intent and followed her like a hawk when she was stateside. However, their actual mission was to prevent an honest airing of the Browder scam to Trump. The C.I.A. was quite cognizant of Trump’s openness to normalizing relations with Russia, and they would do everything possible to sabotage his efforts to do so. Nevertheless, with this historic collaboration between Trump and Putin, the truth is now out about Browder’s $400 million heist that unlawfully went to Hillary. 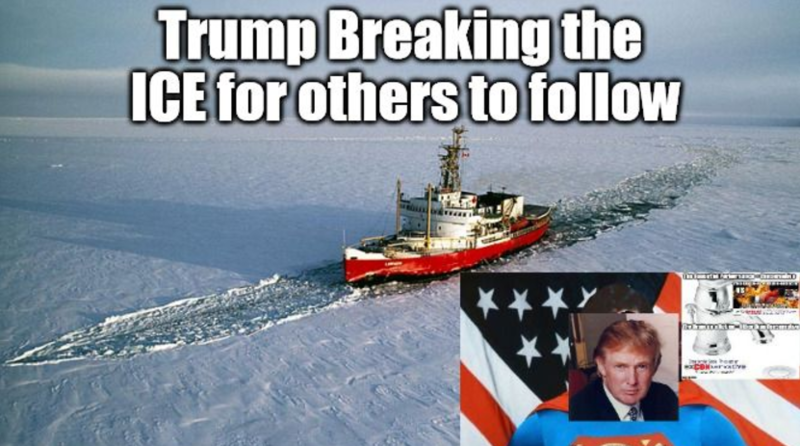 Quite remarkably, this revelation only represents the tip of the Deep State iceberg that the USS Trump icebreaker is cutting through at this very moment. 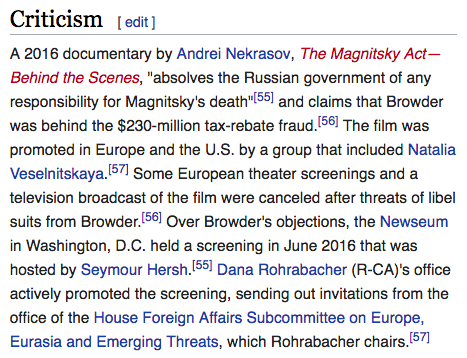 If ever there was a made for TV… or HBO…or Netflix thriller, BROWDERGATE is it. Bill Browder will go down in history as the man who wrote, produced and directed a fake fictional mini series that not only restarted the Cold War with Russia, but also provided the opening to end with finality Cold War 2.0. For a more detailed analysis of the former Browder accomplishment, click on this link: Meet the Corrupt Billionaire Who Has Brought About A New Cold War. In order to learn more about the various ploys and plots surrounding Hillary Clinton and her failed 2016 candidacy, the following article provides a major piece of the puzzle. This back story is just one of multiple reasons why the Democrats have projected their extreme guilt onto the POTUS. The Democratic leadership is now reflexive in their accusations against Trump for serious transgressions that they are guilty of.